Ludhiana, India, February 16, 2005 -- The news headlines “Church asks Prince Charles to choose between love and throne” published in the Indian newspapers on February 14, 2005 has stunned the people in love celebrating St. Valentine’s Day the world over. We at Voice of Christians Evangelical Church, Ludhiana, India are overwhelmed with joy and strongly appreciate and support the long pending decision of Prince Charles, heir to the British throne to marry his most faithful and trusted lover Camila Parker Bowles this year, ending years of speculation when their three decade-old romance would be solemnized in nuptials on April 8, 2005. The Holy Bible says, ”House and riches are the inheritance of fathers; and a prudent wife is from the Lord.” (Proverbs 19:14), “Who so findeth a wife findeth a good thing, and obtaineth favour of the Lord. (Proverbs 18:22) and the Lord God said, “It is not good that man should be alone; I will make him a helper comparable to him.” (Genesis 2:18). In all the ages of the world, Priests have been enemies of Love and Liberty. Before I take this opportunity to explore from the Holy Bible the meaning and importance of the MARRIAGE in a Christian’s life, I would like to urge upon more than a quarter of the General Synod’s members (the highest decision-making body of the Church of England -- who are thought to be uneasy on this auspicious announcement) to honour and respect the decision of Prince Charles, to marry his beloved Camila Parkers Bowles this year. The Christianity is being declined in United Kingdom for the last so many decades on which they should debate prayerfully and plan instantly how to combat spiritual blindness from U.K. They can reverse the prevailing adverse condition of Christianity in England through fast, prayers and provocative preaching. The present research in the West said that do not preach a balanced sermon but provocative sermon to bring the people to Christ. In this way they can bring revival in Christian masses being in power and position in the Church and State. They can visit my Church website’s Archive www.voiceofchristiansministries.org/archive.html for their spiritual ignition by going through my various write ups under the title “Spiritual Food – Window on the World.” These write ups I am writing since 2000 for the revival of Christianity in the West. AS this is my confirmed conviction that until and unless the Christianity is not re-revived in the West, the persecution on Christians in the other parts of world will never be stopped. This is the reason, I have researched on the decline of the Christianity in the West and completed my two years of Bachelor of Divinity in April, 2002 from International Theological Open University, Sri Ganganagar, Rajasthan, India and ready to accept any challenge to re-revive Christianity in the West as an evangelical charismatic preacher and pastor. I am very comfortable with every evangelical Church denomination. One hundred years back United Kingdom was used to export coal, cricket and Christianity around the world. But today to be called Christian in England is embracing. Strident propaganda of New Age and eastern mystical cults has eroded the Judeo-Christian heritage to the point that public opinion is no longer Christian. Religious pluralization has sapped the confidence of many Christians to testify boldly and even believe that Jesus is the only way to the Father. The blanket of materialism and the television culture have deadened the sensitivity of Christians and non-Christians alike. The release of TV programme Jerry Springer the Opera on Saturday January 8, 2005 on BBC2 showing God the Father, Jesus Christ, Mary, Adam and Eve and Satan as warring guests on a special edition of the show –staged in hell was a big game plan of Satan to equate himself with Jesus in hell and to pollute the minds of viewers to sin abundantly. This was denounced by every sensible evangelical Christian including we at Voice of Christians Evangelical Church, Ludhiana – India. We are grateful to the Assist New Service, California U.S.A and Christiantoday.com who released our protest on their websites. We in India appreciate the role of Christian People Alliance political leader Alan Craig in England who led the sensitive evangelical Christians to the BBC building to lodge their protest with BBC office under democratic means against this vulgar show. He has came out as the leader of the Christian masses in England. We pledge to support Mr. Alan Craig by urging our every North Indian Christian settled in England to give their invaluable votes in favour of Christian People Alliance candidates in the forthcoming elections to defeat Satan not only through The Holy Bible but through the Ballot too. As an Indian evangelical Charismatic (Anglican) preacher, I challenge the General Synod’s members of the Church of England to ponder upon above vital issues urgently through fast and prayers, so may the Lord restore the lost glory of Evangelical Christianity in England. Otherwise there (may) be not an Anglican (or) Protestant Church on the earth by 2030 as what the latest world statistics say. The marriage is a divine institution created by God to fulfill His purpose to regenerate human race on the earth. The big mistake the Western Christians have committed in the twentieth century is that they did not regenerate their families, when the Prophet Adam was charged by God to: (1) populate the Earth, subdue the earth , exercise dominion over the animal creation (Genesis 1:28) (2) care for the garden of Eden and enjoy its fruit (Genesis 1:29; 2:15); and (3) refrain from eating the fruit of the tree of the knowledge of good and evil, under penalty of death (Genesis 2:16, 17). The Edenic Covenant was terminated by man’s disobedience, when Prophet Adam and Eve ate of the fruit of the tree of the knowledge of good and evil, resulting in their spiritual and physical deaths (Genesis 3:14-21). a) The need for woman (v v. 18-20). Woman is absolutely essential in God’s plan. This was God who observed, “it is not good that man should be alone”(v.18), and determined to make a “helper” for Prophet Adam. Woman’s role in the will of God was to be a “helper” who was suitable to man in every particular mental, spiritual, emotional, social, and physical need. God undertook an orientation program to show man the need that He alone had observed. He brought to man the birds and beasts He had created, so that man should exercise his dominion over them (v. 18) and name them (v.19). However, in verse 20 it is noted that for Adam there was no “helper” similar to himself. The Holy Bible clearly says that we all have sinned and fall short of the glory of the God and we have no right to judge others. But we praise God that He demonstrates His own love towards us, in that while we were still sinners, His son our Saviour Lord Jesus Christ died for us on the Cross. (Roman 5: 8) Hallelujah! In the prevailing circumstances, by all the means Prince Charles and his fiancée Camila Parker Bowles should be blessed by one and all on the auspicious occasion of their marriage due for April 8, 2005. I will pray at the altar St. Luke’s Church (A 148 years old British Military Church) at Jalandhar Cantonment for their long happy married life, peace and prosperity of the Royal family and re-revival of Christianity in the England. St. Luke’s Church at Jalandhar Cantonment in Panjab State of North India was built by British Empire in India on 16th January, 1857 exclusively built for British Army officers and soldiers in India and the local congregation was not allowed to worship there. The British Infantry graveyard was also earmarked near the Church, where hundreds of graves of British soldiers are found who died in military action in India during British Regime in the last two centuries. Several tablets of British Army officers and soldiers are being found in the walls of Church. The charge of this historical Church was given to the local Indian Christian congregation at Jalandhar Cantonment in 1947 under the Anglican Diocese of Amritsar, Anglican Church of India (CIPBC), when the British Empire quit India. I am the first non Anglican evangelical (Pentecostal) preacher who was brought in by Late Right Rev Babu Masih, Bishop of Anglican Diocese of Amritsar for the spiritual revival of the Anglican congregation in Panjab in the year 2002 when I completed my two years of Bachelor of Divinity. He had ordained me as Deacon in September, 2002 in St. Luke’s Church, Jalandhar Cantonment and appointed me Spokesman of the diocese. He ordained me as full Anglican Priest in March 2003 and subsequently appointed me as Priest-in-Charge of the whole diocese. 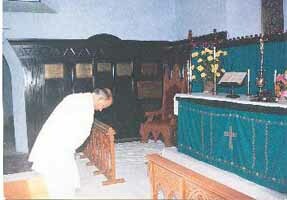 Bishop Babu Masih expired on 30th November, 2003 at Jalandhar Cantonment. The Most Rt Rev Samuel P. Prakash, Metropolitan, Anglican Church of India had appointed me to conduct worship services in St. Luke’s Church after the death of our Late Bishop Babu Masih and his younger son Rev (Deacon) Sunil Kumar as my assistant. 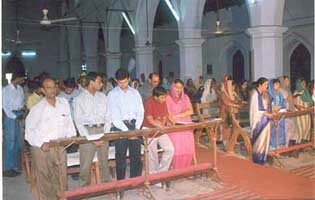 I served in this historical military Church from November, 2003 to December, 2004 and the congregation increased many fold including military personnel working in Jalandhar Cantonment. Rev Sunil Kumar s/o Late Bishop Babu Masih, who has been trained under my supervision during this period, ordained as full Priest on 19th December, 2004 by our Metropolitan of India The Most Rt Rev Samuel P. Prakash and appointed him as priest-in-charge of this historical church. We celebrated 148th anniversary of St. Luke’s Church on 16th January, 2005 at Jalandhar Cantonment and I delivered the key message titled “Christian Heritage” on this occasion. My paternal grandfather Lat Nanhe Mall Singh an Indian converted Christian soldier who fought in the World War I in 1914 in the British Royal Army was the recipient of ‘The Princess Mary Christmas Gift 1914.” This is an embossed brass box presented by Her Royal Highness Princess Mary, the 17th years old daughter of the King George V and Queen Mary of Great Britain. The inscription read, “A Gift from the nation for the every Sailor afloat and every Soldier at the front.” The lid of the box bore the head of Princess Mary, with the words, “Imperium Britannicum” above and “Christmas 1914” below. At the sides and corners are the names of Britain’s allies -- France, Russia, Belgium, Japan, Serbia and Montenegro who all fought in World War I. Later my grandfather was given poison by his Hindu cousin brothers and he died in July, 1920. Thus my grandfather fought for the physical survival of Great Britain and was martyred for his newly found Christian faith. I am his (grandson) is now fighting for the spiritual survival of Great Britain (and) the whole West as international media missionary since October, 2000 and wish to strengthened the hands of evangelical organizations engaged in re-evangelizing the United Kingdom and whole the West. Rev Isaac Newton Johnson is an Indian Evangelist since 1976 working with non-Christian brothers in North India. He is international media missionary and Christian speaker. 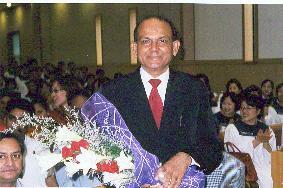 He has been invited by SungKwang Presbyterian Church, Guri, Seoul, South Korea in June-July, 2004 as Guest Speaker from India. He preached in Indian, Pakistani, Nepali and Korean brothers there. Five brothers and one sister of Indian origin accepted Lord Jesus Christ as their personal Savior and baptized during his ministry in South Korea. He has founded “Voice of Christians Evangelical Church” at Ludhiana, India in 1999 (A House Church) working among poorest of poor people, imparting education to them and sharing the good news of Lord Jesus Christ. (Pictured: Rev Isaac Newton Johnson being honored in SungKwang Presbyterian Church, Guri, Seoul, South Korea in June 2004). He needs committed prayer partners and Church ministry supporters around the world to proclaim the Gospel in India and to the end of the earth. Rev Isaac preaches in English, Hindi, Panjabi and Urdu languages simultaneously without interpreter.